Baby Rhino Manji at Baby Rhino Rescue | Adopt and Donate Now! Manji arrived at C4WA in October 2014 when his mother was killed by poachers. He was flown in by helicopter, still pink and no more than a few days old. The poachers had hacked him with a machete, and he had a deep wound above his eye. It was a miracle that he survived. Manji is the youngest rhino the sanctuary has ever rehabilitated. Initially it was thought that Manji had brain damage because he would not stop moving in circles, both inside and outside the crate. It was also feared that his eyesight had been impaired. He was operated on and spent the first few nights sleeping with his head on Sam's (one of the animal managers) chest. But Manji has made a full recovery! His wound has healed completely, his eyesight is fine and he has no brain damage and walks and runs as well as any other rhino. Initially he shared an enclosure with River, Thor, Tyson and his best friend Venus. 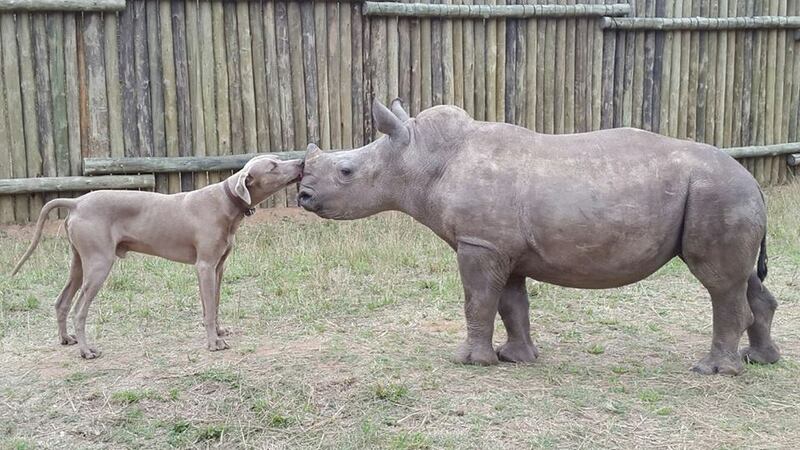 Manji is fiercely protective of Venus, who has had to be carefully rehabilitated because of a wounded foot. When Venus’ dressing was being changed, Manji would charge any of the rhinos who tried to venture near, even though he is a quarter their size! The other rhinos have since been moved and now Venus and Manji have the enclosure to themselves. They are given access to the outside area twice a day and walk out together, Manji never lets Venus be anywhere other than by his side. Manji has been through so much, but he has put on weight, is growing strong and is very used to his new life in his safe, new home.